I stayed at Hotel Forum which is across the street from the Amphitheater of Pompeii. If you want to be situated close to the ancient city of Pompeii and Amphitheater I recommend this hotel. The Amphitheater of Pompeii is located in the ancient city of Pompeii. To gain access to the ancient city you must first buy a ticket. 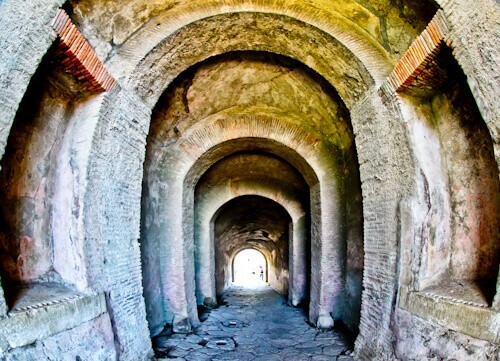 Once inside ancient Pompeii, you are free to enter the amphitheater as many times as you wish. It’s possible to walk around the tunnels and onto the arena. The spectator area however, is out of bounds. 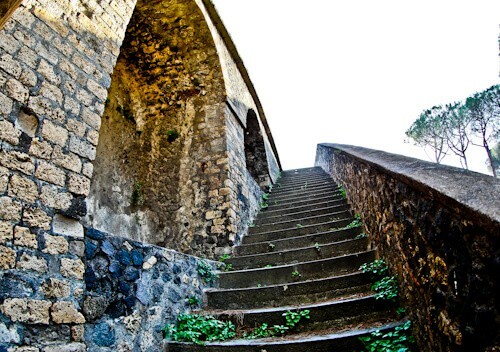 This amphitheater is very well preserved because it was buried for so many years by the 79 AD Vesuvius eruption. The amphitheater had a capacity of 12,000 spectators. 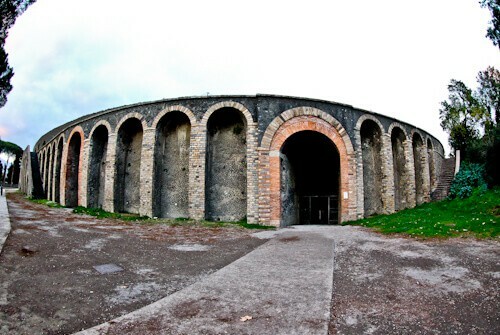 It was the first Roman amphitheater to be made from stone, previous amphitheaters had been made out of wood. When it rained during a live event, a huge canopy covered the amphitheater. This canopy is known as a velarium. When you visit you’ll be able to see these rings which held this is place. I visited the amphitheater late evening in the winter. For those who want to take photographs without thousands of tourists I recommend visiting early morning or late evening. Additionally, visiting in off season helps! The amphitheater is spacious and has easy access. In fact when the spectators needed to visit the bathroom or buy a snack, they would have to visit the palaestra building located next door. When they left the stadium they were leaving into open spaces which ensured they flowed out speedily. When you visit the amphitheater it’s worth checking out the various entrances and exits. Considering this was designed over 2000 years ago, it’s not much different to today’s designs. 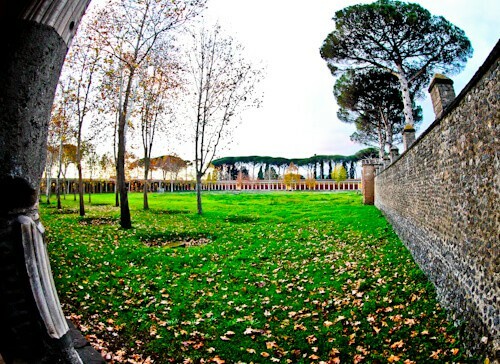 Adjacent to the Amphitheater of Pompeii is the huge palaestra. If you needed to go to the bathroom during a live performance, they were located in the palaestra. In additional you could buy drinks and snacks here. In many modern stadiums there is a mini stampede whilst buying snacks and visiting the bathroom. Over 2000 years ago in ancient Pompeii the problem of overcrowding in certain areas had already been solved. The arena was the scene of circus shows and Gladiator games. 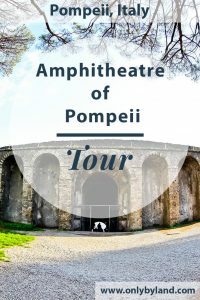 Other amphitheaters like those in Rome and Pula had underground sections which were used to store animals etc.. At Pompeii however, all the animals entered through a huge entrance. As you walk through this entrance, you’ll be following in the footsteps of elephants, tigers and all kinds of exotic animals. In addition naval battles were held in the arena. Using a system of canals it was possible to flood the arena floor. British rock band Pink Floyd famously played live at the Amphitheater of Pompeii in 1971. They played live only to the camera crew. In 1972, this was released as a concert documentary film called Pink Floyd at Pompeii. Pink Floyd also played at Pompeii in 2016. In 2016 they played a concert in front of an audience. 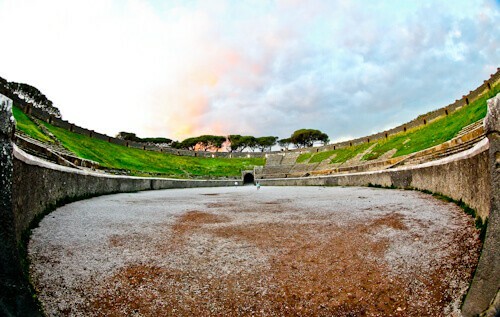 This was the first live performance to an audience at the Amphitheater of Pompeii since 79 AD. As you walk around the interior of the amphitheater you will see memorabilia of the 1971 concert. 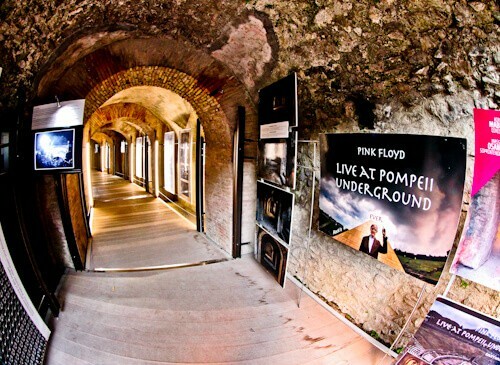 Hopefully you like Pink Floyd music as it’s played on a continuous loop at the Amphitheater of Pompeii! Make sure you give yourself enough time to visit the Amphitheater and Palaestra. You need to fit these in as well as the rest of the ancient city of Pompeii. I recommend visiting this part of Pompeii at the very beginning or end of the day. This increases your chances of having it all to yourself! How to visit Mount Vesuvius. Such a remarkable and outstanding architecture, James! I guess that seeing Pink Floyd performing there back in the 1970’s must have been unforgettable! It’s remarkable that they use an arena from over 2000 years ago as an example of modern stadium design today! It must have been a magical experience watching Pink Floyd perform live here too! Hi Joey, it makes you wonder why they made so many badly designed stadiums before realizing this was how to do it!